2. 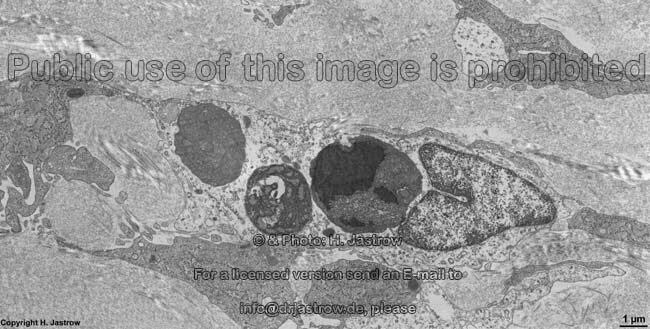 Pinocytosis (incorporation of extracellular fluid). 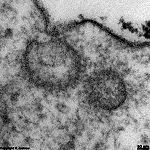 In case of 1. phagocytosis a surface antigen of the particle e.g., a bacterium, binds to a receptor of the phagocyting cell, e.g. 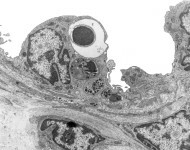 a macrophage. This results in formation of mobile cell processes (pseudopods) that embrass the particle. 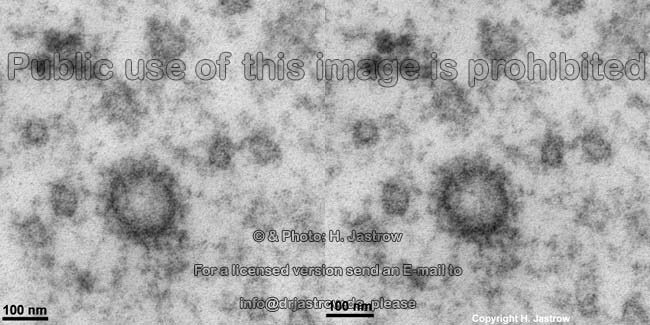 These pseudopods fuse and finally completely cover the particle which is drawn into the cytoplasm. In this way a large endocytotic vesicle is formed which is called phagosome. Many primary lysosomes begin to dock on this phagosome and fuse with it. 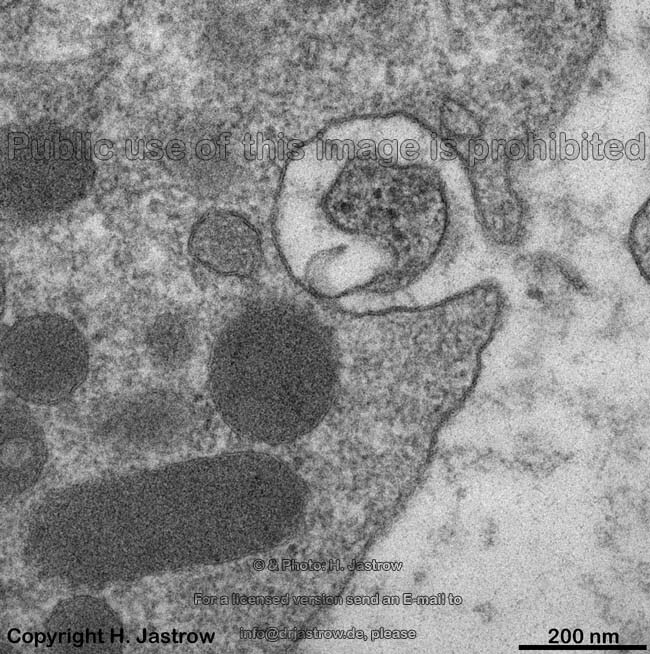 By this the enzymes of the primary lysosomes begin to digest the content of the large vesicle which now is called phagolysosome or heterolysosome. 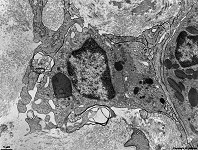 During digestion water and usable substances are transported through the membrane of the phagolysosome wherby it becomes smaller and smaller. The remaining content that cannot be further digested by the enzymes e.g., metal-, quartz- or plastic particles or lipofuscin, is more and more concentrated and finally a residual body which is also called tertiary or telolysosome is formed. The latter either fuses with the cell membrane to discard its content into the extracellular space or remains reactionless in the cell until death. 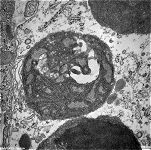 Only some cells are capable to perform phagocytosis which mostly serve for body defense. The macrophages are capable to incorporate very large particles that may even be larger than the macrophage itself. The microphages e.g., neutrophilic granulocytes may only take particles in that are up to the size of bacteries. 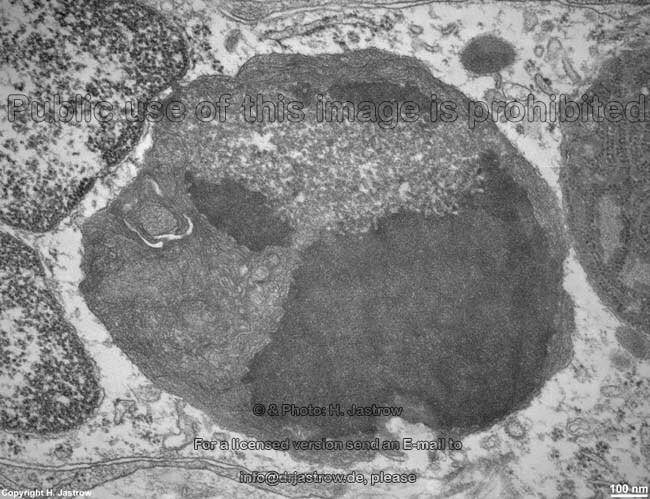 In case of 2. pinocytosis a process called macropinocytosis (intake of large vesicles that are visible with the light microscope) is only seen in amoeba whereas micropinocytosis is typical for many different kinds of mammalian cells e.g., in enterocytes of the gut. 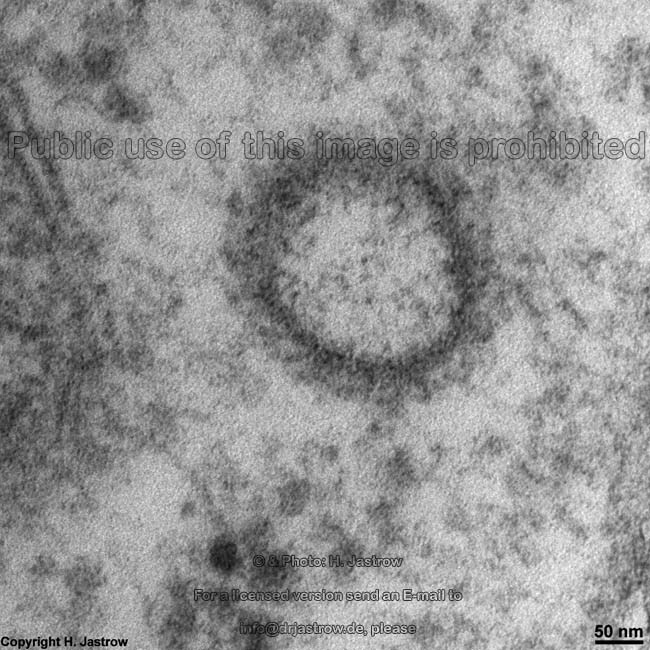 Hereby the cell membrane produces small endocytotic vesicles which can only be seen in the electron microscope (diameters ~ 50 - 400 nm; in most cases about 100 nm). 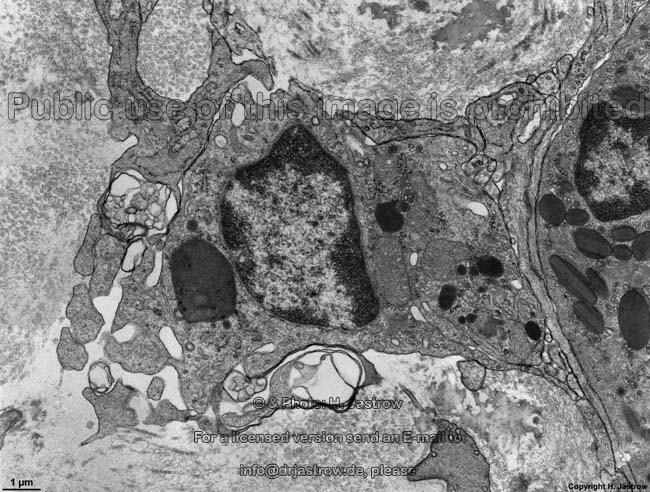 Micropinocytosis permits substances in molecular or kolloid solution to be resorbed by inclusion in vesicles. This is necessary for molecules for which the cell membrane posseses no transport proteins. 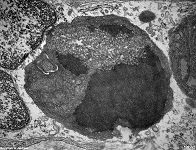 The non-receptor mediated intake of small amounts of extracellular fluid with all solved substances by formation of caveols is called unspecific (micro)pinocytosis or constitutive endocytosis. The underlaying molecular mechanism still remains to be elucidated. The most common receptor mediated endocytosis has been demonstrated for lots of substances and begins by their binding to more or less specific receptors. The latter evoke an aggregation of clathrin molecules deriving form cytoplasm to the inner wall of the cell membrane by a cascade of reactions. 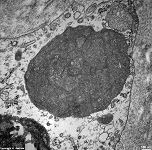 This can be seen in the electron microscope in form of a thin electron-dense seam. 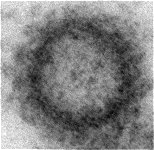 Small coated pits appear at first that become spherical and larger and finally give rise to an endocytotic vesicle which is called clathrin-coated vesicle. 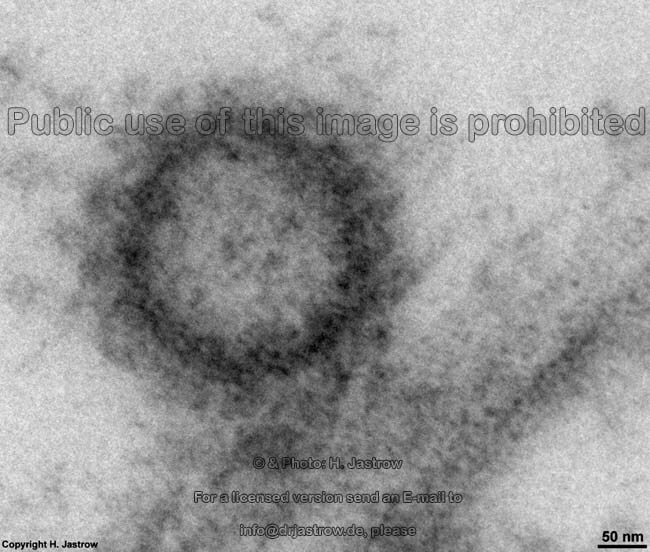 The endocytotic vesicles are transported to their targets in the cytoplasm. A substance specific vesicle sorting is responsible for the proper delivery of the vesicle to either Golgi-apparatus, RER, lysosomes or through the entire cell to the opposite membrane in sense of a transcellular transport, i.e. cytopempsis which is often seen in endothelial cells --> see transcytosis). 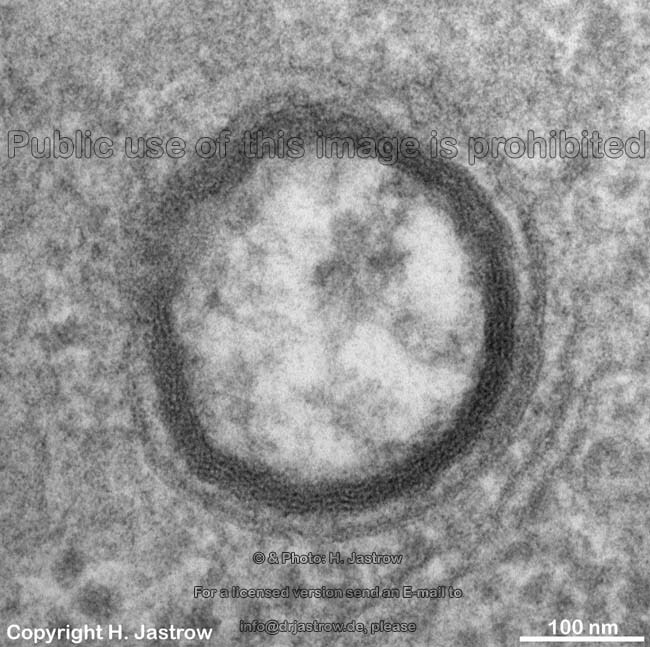 The clathrin-coated vesicles have diameters of 50 - 100 nm and are covered by a skeleton of usually 12 penta- and 8 hexagons of altogether 36 triple skeletons of clathrin. 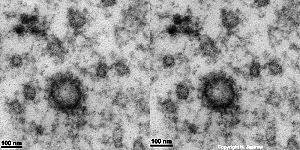 This fibrous protein has a havy chain of 180.000 daltons [Da] and a light chain of 35.000 - 40.000 Da. Further the 900 amino acid-long dynamin, which binds and hydrolyses GTP is present in the coat. 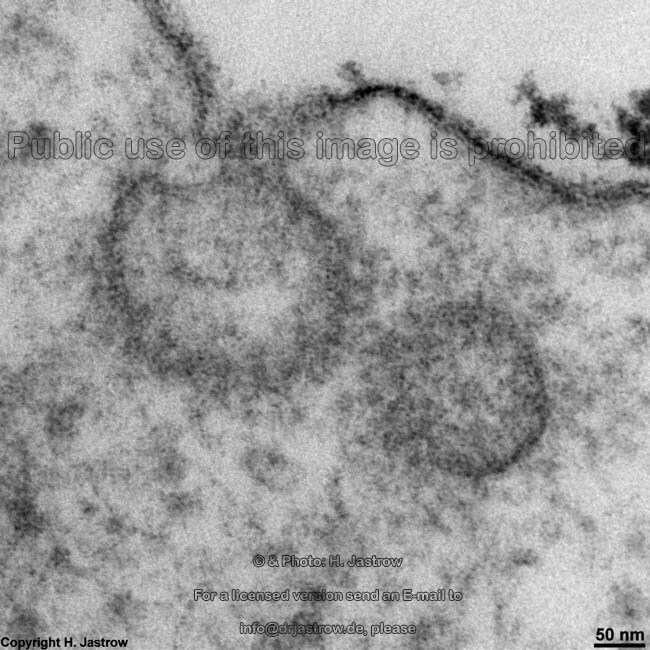 Assembly particles are located between the clathrin and the outer membrane of the vesicle in a distance of about 20 nm to the membrane. These particles are 340.000 Da proteins consisting of 4 interlinked polypeptid chains. 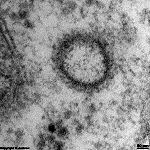 They bind to the heavy chains of the clathrin and are responsible for its penta- hexagonal assembly. 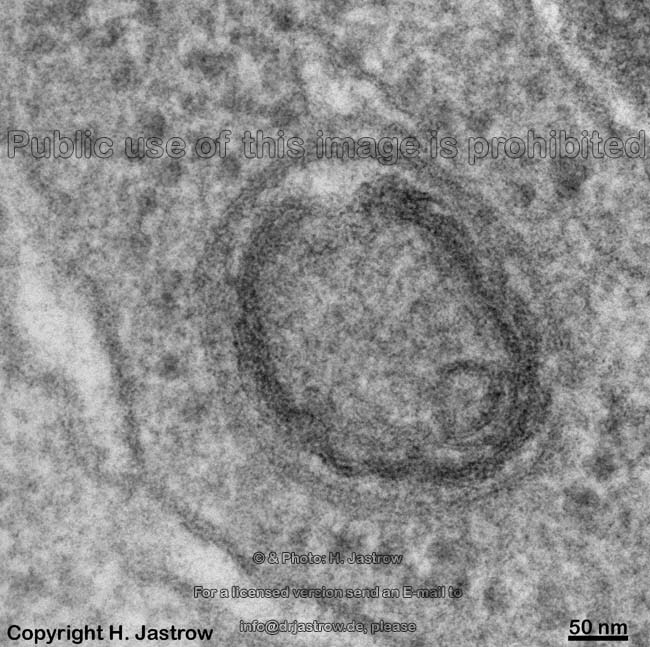 Soon after the leaving the cell membrane the clathrin coat around the vesicles begins to dissolve for recycling of the clathrin molecules. 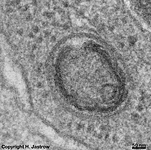 The receptor proteins are ususally recycled as well in form of small membrane vesicles after the incorporated vesicles fused with so-called sorting vesicles from the endoplasmic reticulum. Endocytotic vesicles are seen in a large variety of cells. Four images were kindly provided by Prof. H. Wartenberg; other images, page & copyright H. Jastrow.